Aussie Aussie Aussie! Ouch Ouch Ouch! 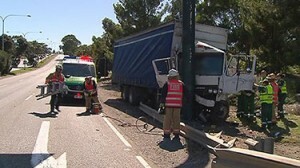 Australian Police are investigating a deadly truck crash that took place last month in ‘Happy’ Valley. The 45-year-old Salisbury man died on March 7 when his truck veered onto gravel and crashed into a sign post on a local road. Police believe he was attempting to avoid a collision with other cars. “Brake failure was the cause of this accident… it’s cost the life of the driver, the family’s grieving, but the accident could have killed other people as well,” Detective Acting Superintendent Greg Hutchins said. For the first time ever, Major Crime, Major Crash and Heavy Vehicle officers are joining forces to investigate whether the driver’s employer is at fault. Last Friday, they reviewed other trucks at the northern suburbs business, finding that 11 were defected. Police said that the vast majority of them had significant brake issues. Reports say Police have already communicated with former employees and want to charge the owners with negligent manslaughter if there is enough evidence to do so. Police will not publicly name the company, but believe many within the trucking industry will know either the driver or the business in question. They are urging former employees and anyone with further information to come forward. This entry was posted in Bad Braking, Crash, News by Eli Banayan. Bookmark the permalink.